The New fashion black color vintage bracelet watch butterfly pendant genuine cow leather quartz wristwatch is the perfect accessory for casual outings, as well as for formal parties. 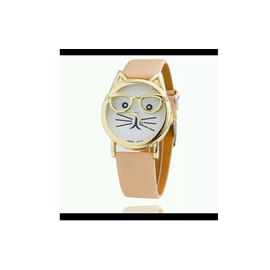 The trendy watch features a quartz movement that is battery driven. It has an aesthetic dial with 3 analog hands and bold Arabic numerals against a delicate cream background. It is fitted in a highly stylized brass case that is adorned with antique finish motifs. The dial measures a mere 2.6cm. It rests on an eye catching red Cape Cod style band that is made up of genuine cow leather. The material of the band is extremely soft, enabling you to wear this timepiece for hours on end. 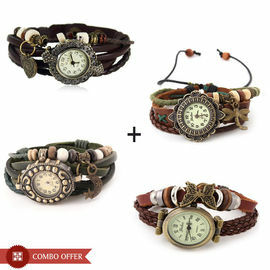 A bunch of charming beads, woven on the band further enhances the vintage style of the watch. 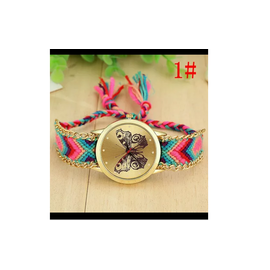 Suspended from the beaded band is a cute butterfly made of brass. 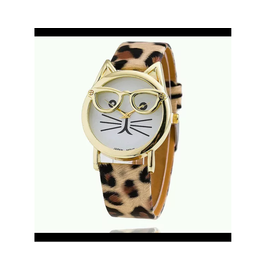 The exquisite watch can be worn with your casual outfits, as well as with party ensemble. Avoid contact with water and chemicals such as perfumes and deodorant sprays. Store your jewelry in individual plastic zipper pouches to avoid tarnishing, scratching and breakage. All measurements are manual so there could be slight variations. The product color may sometimes slightly vary due to photographic lighting sources or your monitor settings. 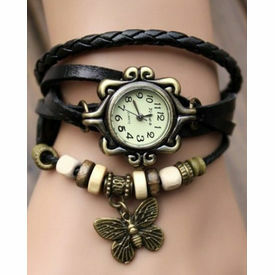 The New fashion black color vintage bracelet watch butterfly pendant genuine cow leather quartz wristwatch is the perfect accessory for casual outings, as well as for formal parties. 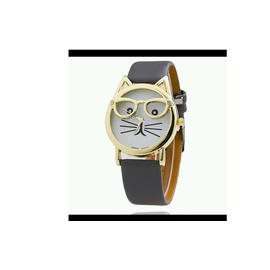 The trendy watch features a quartz movement that is battery driven. It has an aesthetic dial with 3 analog hands and bold Arabic numerals against a delicate cream background. It is fitted in a highly stylized brass case that is adorned with antique finish motifs.The dial measures a mere 2.6cm. It rests on an eye catching red Cape Cod style band that is made up of genuine cow leather. The material of the band is extremely soft, enabling you to wear this timepiece for hours on end. A bunch of charming beads, woven on the band further enhances the vintage style of the watch. Suspended from the beaded band is a cute butterfly made of brass. The exquisite watch can be worn with your casual outfits, as well as with party ensemble. 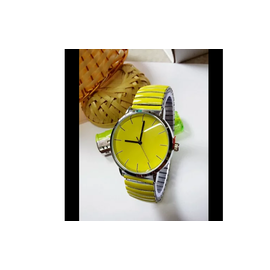 Material Alloy, Movement Size No Color Black Product type Strand, Watches Clasp / Closure Button Clasp Occassion Festive, Office, Party Care Tips Avoid contact with water and chemicals such as perfumes and deodorant sprays. Store your jewelry in individual plastic zipper pouches to avoid tarnishing, scratching and breakage. Disclaimer All measurements are manual so there could be slight variations. The product color may sometimes slightly vary due to photographic lighting sources or your monitor settings. 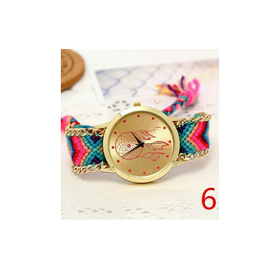 Myself Dipi, i ordered this watch to gift to my sister, "Elegant Black Leather strap Vintage Butterfly Bracelet Watch for women and ladies" and i must say, i impress with the delivery speed as well quality of the products. Product sent was as truly described, leather vintage typr looking watch with a small dangling a mascot over the leather belts. The watch goes with any outfit, the most importantly, people did notice the watch and appreciated the quality.